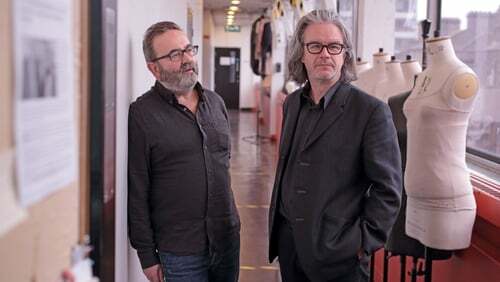 Neil Murray and Graham McLaren, the Directors of the Abbey Theatre, have been criticised in an open letter signed by more than 300 members of the Irish theatre community, among them actors, technical staff and theatremakers. The letter, addressed to the Minister for Culture, Heritage and the Gaeltacht Josepha Madigan, the Chair of the Arts Council and to the Chair of the Abbey Board, which can be read in full below, expresses concern with the direction taken by The Abbey under Murray and McLaren, who took the reigns at Ireland's National Theatre in 2016. The 312 signatories include a number of Irish theatre veterans, several of whom have appeared on the Abbey stage in recent years. The letter compares the year that Murray and McLaren were appointed at The Abbey - 2016, when it claims that the theatre directly employed 123 actors in Abbey productions and 90 actors in readings and workshops - to the duo's first year at the helm, in which, it claims, just 56 actors were directly employed by the theatre. The letter does not include figures for readings or workshops. In addition, the signatories claim that the freelance theatre community in Ireland has been 'cast adrift' by the duo, as a result of a shift in programming policy, leading to less direct employment by the Abbey. They also argue that the Abbey's programming of work by theatre companies already in receipt of funding amounts to 'double funding'. A particular point of contention is The Abbey's recent Christmas offering, Come From Away, an award-winning American musical currently playing to sell-out audiences on the Abbey main stage. Murray and McLaren, the former Co-Directors of the Scottish National Theatre, were the subject of a 2018 RTÉ documentary, A Riot Of Their Own, filmed during their first year at The Abbey. Their recently announced 2019 programme includes a new adaptation of Enda O'Brien's novel The Country Girls, directed by McLaren, alongside work from Irish theatre companies Theatre Upstairs, Bitter Like A Lemon, Livin’ Dred Theatre Co and THEATREclub. The changing artistic model of producing fewer in-house productions and presenting or co-presenting more has caused devastation amongst our ranks. Although the management’s strategy of offering diversity to their own audiences is admirable in theory, it offers up several problems in practice. The National Theatre reducing its own production output means less diversity, and reduced employment, not more. There will not have been an Ireland-based actor in an Abbey Theatre production on an Abbey stage since Jimmy’s Hall ended on 8 September 2018 until The Country Girls opens on 23 February 2019. That is five and a half months without an Ireland-based actor directly employed by the Abbey. The numbers are stark and are worth stating. In 2016 the Abbey directly employed 123 actors in Abbey productions and 90 actors in readings and workshops. Then, in 2017 the Abbey directly employed only 56 actors. No figures are available for readings or workshops that year. Fifty six. That is a reduction of 46% of actors appearing on stage directly employed by our National Theatre. We would surmise that this reduction will be substantially higher when workshop figures are made available for 2017. Though the casting and employment statistics have been removed from the Abbey website, an approximate calculation for 2018 is 65 actors employed directly by the Abbey. In a theatre founded by writers and actors it is profoundly worrying that there is no commitment to sustaining that community. -The Abbey receives the lion’s share of available funding - €6.8m in 2018, with an additional €200,000- touring grant. With the Abbey now co-producing with the major independents, whilst receiving 10.25% of the overall Arts Council budget, it now also benefits from the production budgets of some of the better-funded independent companies. A clear case of double funding. -Despite The Abbey being in receipt of 50% of the Arts Council’s entire Drama budget; and now extra resources from other companies; our Actors, Directors and Designers are being paid less when working at the Abbey than before and for shorter runs. They are being contracted in the Abbey by the co-producer - an independent company that offers lesser rates. This reduction in pay can be as much as 25%. -Independent productions, which would previously have found a home elsewhere, are now being housed at the Abbey. Thus venues, which were developed to host Ireland’s independent companies, now have gaps in their calendars. This has the knock-on effect of reducing employment in these venues. -Contracts for working weeks that would have previously been on offer from Independent companies to freelance Technicians have been reduced, covered as they are in these co-productions/co-presentations by Abbey permanent staff. -Not a single National Theatre contract has been given to an Irish-based Set Designer on the main stage in either 2017 or 2018. -The abolition of the Casting Department has created a significant disconnect with Actors. The tradition of open auditions for graduate and young actors is no longer available. There is no single person with experience and responsibility for casting with whom actors and their agents can build a relationship or who can mentor up and coming talent. -This year’s Christmas offering on the National Theatre main stage has for so many become the final straw. Any critical questioning of the wisdom of the Irish National Theatre using its resources to facilitate a Canadian commercial management’s seven week stop-over, before going into the West End, have been cynically framed as xenophobic and little islander. This disingenuous accusation is beneath contempt, and we dismiss it with as much alacrity as the Abbey management dismisses the employment of its local workers over Christmas. Irish audiences deserve to have access to shows of this international reputation coming from and going to Broadway and the West End: but of course they already have, in our various No1 receiving venues. -To believe that our National Theatre needs to engage with audiences in Ireland, but not its Theatre professionals is a fallacy. The current working practices in The Abbey Theatre – The National Theatre of Ireland are in direct opposition to the priorities as set out in the Government’s Culture 2025 document, The Arts Council’s Making Great Art Work policy, as well as their own mission statement. Irish Art and Culture are internationally held in high regard. Consequently, our Artists have over many years done the State sterling service. At home and abroad our talents and expertise have been at the heart of promoting Tourism, and in developing international relationships for trade and negotiation. Our Theatre workers have been at the frontline of ‘Brand Ireland’, only time and again to return home to live on the poverty line. The reduction in the proportion of Abbey Theatre budget going to Ireland-based Performers, Directors and Designers serves to rub further salt in the wound. We respectfully ask that The National Theatre engages in a greater percentage of in-house productions, as opposed to co-productions or buy-ins. It is the proportion which is so damaging, so heedless. We demand that Performers, Directors and Designers whose work is used by the National Theatre are given National Theatre terms and conditions, along with every other employee in the building.